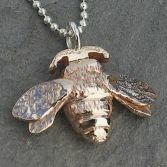 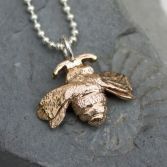 My Bumble Bee Necklace in Bronze or Silver is exclusive to JB and has been handcrafted by me and then cast. 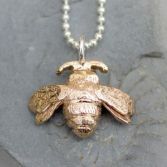 The Bronze Bumble Bee is made of solid Bronze and has a sterling silver ring soldered upon the top and is hung on a sterling silver chain.The Bumble measures approximately 2.8cm wide and 2.0cm long. 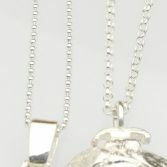 The Sterling silver Belcher chain is available in 16'', 18'' or 20'' please use drop down option to select your preferred chain and length (for the belcher chain a 2 inch extension chain is also provided so you can adjust the length. 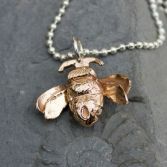 To select the Bumble Bee necklace in silver see other listing.